Pet birds are intelligent and active animals and once their nutritional and housing needs are met, it is important to also meet their psychological needs. Birds are, by nature, flock animals and the household occupants become the flock that the bird now lives in. Locate the cage near the family activity in the home. Supervised time out of the cage is encouraged for most bird species. Play areas or 'play gyms' are excellent for physical and mental exercise and can be designed in such a way as to encourage food foraging or play behaviour. For examples on how to encourage foraging behaviour, please check the Avian Studios website. Select toys with safety in mind. Natural products such as leather, wood, and rope are preferred. Many metals can contain lead or zinc and stainless steel is always preferred. Choose a toy appropriate for the bird's beak strength and avoid toys with sharp hooks. Rotating toys can helps maintain a bird’s interest but remember, bird toys are not meant to last, but rather to engage the bird in safe destructive chewing behaviour. For some birds, new toys will need to be slowly introduced by placing them nearer and nearer the cage. Understanding what drives a bird on a day-to-day basis in nature helps guide it towards a life of desirable behaviours as a pet. Most birds spend their day foraging for food and interacting with their flock mates, both watching for predators and grooming one another. Only yearly do they seek out a nest, mate and produce young. Providing a pet bird with foraging opportunities, items to chew and with training exercises helps a pet bird to maintain normal flock interaction. Avoiding kissing and stroking a pet bird, not providing nesting material or allowing the bird to build a nest can help avoid undesirable behaviours such as screaming, biting, chronic egg laying, cage aggression and feather destructive behaviour. 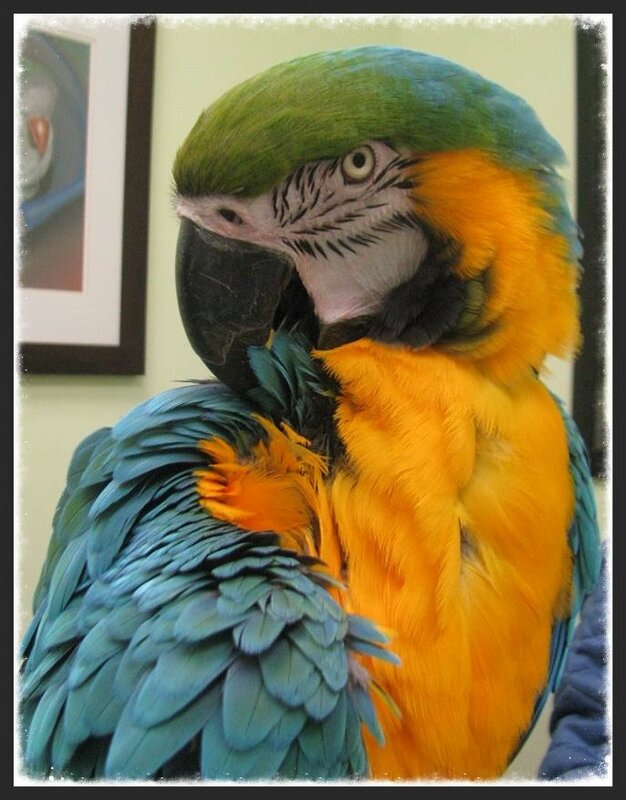 Routine wing clips and regular nail trims may be required for pet birds. Maintaining foot health is important and regular nail trimming ensures that nails do not become overgrown, too sharp or curled. Wing clipping is typically done to prevent escape or injury in the home and can make training a new bird easier. Owners that choose to keep a bird flighted should ensure that the flight areas in the house are ‘bird proofed’ to prevent injury. Birds will go through a natural moult where old feathers are lost and new feathers regrow and wing clips will need to be repeated accordingly. All birds bathe in some way to keep their feathers in peak condition. Some prefer a dish, others a gentle spray and still others will bathe in the wet greenery offered as a vegetable source daily. Clean slightly warmed water is best for bathing. 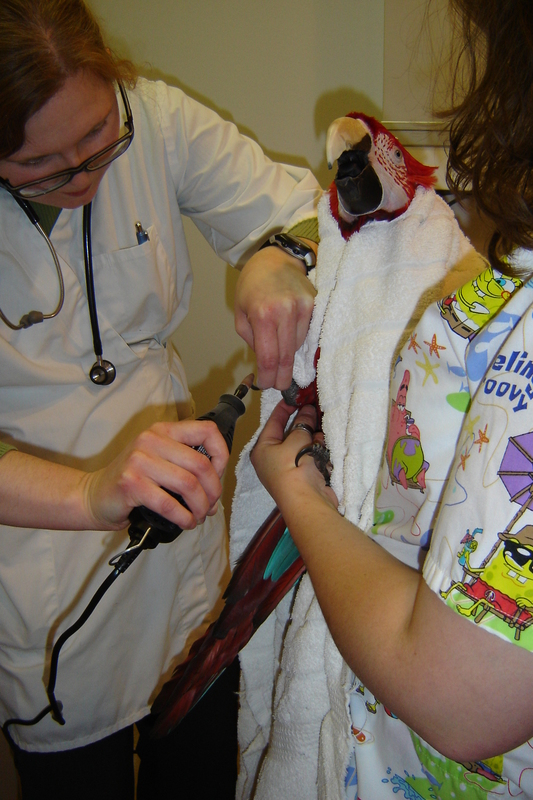 Mite boxes or mite sprays should be avoided and if external parasites are a concern, an avian veterinarian should be consulted. Some birds are purchased or adopted wearing a leg band. Bands can be removed and if the band is an open ring, there is a risk that it can get caught and cause the bird harm. Closed bands (a complete ring) are safer, but should be checked regularly to ensure that they do not become too tight or that material builds up underneath. A safer and more permanent form of identification can be achieved with the placement of a microchip. Any product that affects air quality can potentially be toxic to birds and cigarette smoke, scented candles or air fresheners, scented cleaning products, heavy perfumes, heated Teflon cookware and self cleaning oven fumes should all be avoided. Birds can benefit from natural light and fresh air, but if taking a bird outside, precautions should be taken. The bird should be contained in a cage or carrier and always supervised. Wild birds and rodents should not have access to the cage. Shade and water should be provided and peak mosquito periods should be avoided as pet birds bitten by a mosquito carrying West Nile Virus will die. 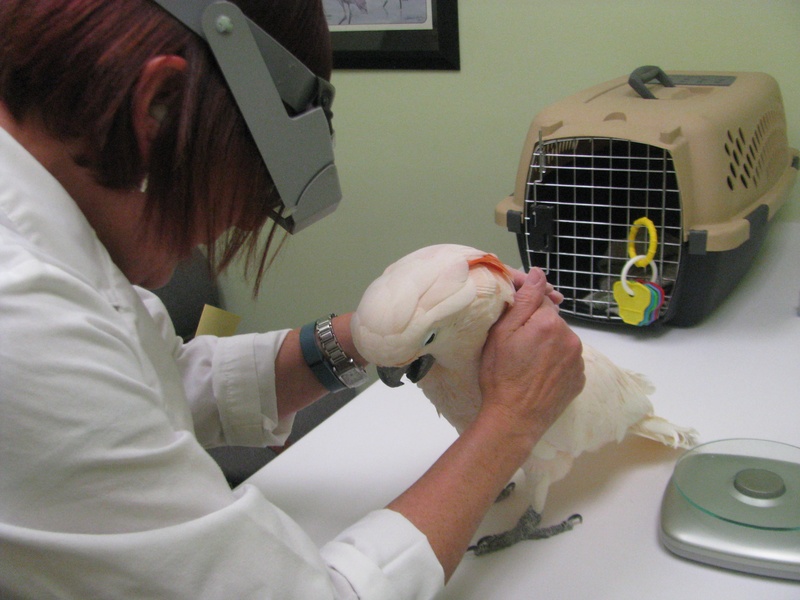 An annual visit to an avian veterinarian is recommended for all pet birds. A health exam should include evaluation of diet and housing and a full physical exam. Because birds are so adept at hiding their problems, testing such as blood sampling, evaluation of the droppings, or microbiological evaluation (swabs from the vent or throat) may be recommended. Yearly exams allow early detection of problems, establishes baseline parameters, and provides a forum to update owners on the latest in care and husbandry. Choose as large a cage as is feasible. Ensure the bars are proportional to the size and strength of the bird. Square or rectangular cages are preferred over round cages. Cages must be made of non-toxic material and be easy to dismantle and clean. Birds fly horizontally, not vertically so the cage should be wide enough to accommodate the bird stretching its wings and tall enough to accommodate the length of the bird's tail. The value of providing an ultraviolet light source is controversial but if choosing to do so, ensure the light shines from above the bird and not from the side. Perches should be clean and of varying diameter. Natural wood perches are preferred, using unsprayed, non-toxic branches such as a hardwood or apple. When bringing in natural branches for perches, clean with soap and water, disinfect with an appropriate veterinary disinfectant, and ideally bake at 250° F for 10 minutes to help ensure any microorganisms that wild birds may carry are killed. Perch placement should allow for climbing and jumping and placed to prevent droppings from contaminating food and water dishes. Avoid sandpaper products. If using ‘cement’ perches, ensure the perch is not the bird’s roosting perch. Keep cotton perches clean and trimmed of fray threads and replace when necessary. Newspaper, paper towels, or used computer paper are preferred substrates as they are inexpensive and allow for easy viewing of the bird's droppings. Avoid substrates such as kay cob, kitty litter, wood chips or gravel paper. Do not sprinkle grit or gravel on the cage floor. Both the cage bottom and the food and water dishes should be cleaned daily. Bird droppings and spoiled food provide the perfect environment for bacteria and fungi to grow and are potentially a disease source for the bird. Daily cleaning of the cage bottom allows for close monitoring of the bird’s droppings and allows for rapid detection of other problems such as blood or regurgitated food. Perches and cage bars should be wiped down as needed. The entire cage should be dismantled, cleaned with soap and water, then disinfected and rinsed routinely. A healthy bird can tolerate temperatures that are comfortable to its owner. Sudden changes in temperature may be a potential threat to a sick bird. Avoid placing the bird in drafty areas. Birds can adapt to a variety of humidity levels though sub-tropical birds may benefit from additional misting or a humidifier if living in drier climates. A cage needs to be both secure from the bird and for the bird. Ensure the bird cannot escape the cage by unlatching the door or squeezing through food or water dish portals. If using a cage cover, ensure that the bird is not chewing at the cover and that the bird’s nails cannot become hooked in it. Placing the cage against a wall or in a corner can offer the bird a sense of security. Cage height should not be lower than 3 feet from the ground. If the cage is suspended from a ceiling hook, ensure hooks are well anchored and can support the weight of the cage and the bird. Avoid placing the cage on or too near a television or stereo. Choose a room where the bird can be near family activity but away from kitchen fumes. Some bird species benefit from covering the cage at night. This helps provide routine, a sense of security and helps ensure the bird will get 10-12 hours of sleep. Some birds, particularly cockatiels, may panic if completely covered, so either partial coverage or a night-light is recommended. If room permits, provide a separate sleep cage and sleep location. between what is offered and what is actually eaten. In general, a healthy diet will consist predominantly of a formulated pellet, along with a healthy choice of vegetables, fruits and whole grains and a limited amount of seed, nuts and other food items. Formulated diets are most commonly provided as pellets and are available in a variety of colours, shapes, sizes, textures and flavours. Each pellet is formulated to contain essential nutrients such as protein, carbohydrates, fats, vitamins and minerals based on the current understanding of the nutritional requirements of pet birds. Formulations should be chosen based on the bird's age, size, health and life style needs. Conversion to a formulated diet is a gradual process and consulting an avian veterinarian prior to converting is advised. We recommend referring to our Conversion Handout for additional information on how to convert your bird. Close monitoring of a bird during the conversion process is necessary, as the bird may initially not recognize the formulation as food, and inadvertently starve itself. Depending on the species of bird, formulated diets should comprise 50 – 80% of the bird’s total diet, with the balance including vegetables, seed or nut treats, and some fruit. The amount of pellets fed should be measured daily to prevent over-feeding. An all seed diet is NOT a complete diet and birds eating seed only will develop disease. Seeds and nuts are typically high in fat and energy, but low in Vitamin A and calcium and as such, should only make up a small part of the daily diet. Seed should be freshly harvested and should not look or smell moldy. Healthy nuts such as almonds or walnuts should be chosen over peanuts, which can inadvertently carry a fungal toxin harmful to birds. Whole grains can help provide fiber and nutrients to a diet. Processed products such as white bread, rice or pasta should be avoided. Instead, offer small amounts of brown or wild rice, whole grain bread or whole grain pasta. Items in this food group can contribute to obesity and hormonal activity if fed daily. Vegetables contain essential vitamins and minerals and should comprise approximately 15-20% of the diet. Dark leafy green or yellow vegetables are the richest sources of nutrients and vegetables such as kale, broccoli, endive, lettuces (excluding iceberg), parsley, red or yellow peppers and string beans are preferred. Starchy vegetables such as beets, peas, carrots, pumpkin, squashes, corn on the cob and cooked sweet potato, although often preferred by the bird, should be offered less frequently. Fruits should be offered in limited quantities (less than 5%) in order to prevent over consumption. Offer high anti-oxidant, vitamin rich fruits such as berries, pomegranate, mango, papaya, melons, or fresh figs. ‘Sugar bombs’ such as grapes, apples and bananas should be rarely fed. Mature legumes (cooked beans such as navy, kidney, garbanzo, lentils) or animal proteins (such as cooked fish, beef, chicken, or eggs) should be an infrequent treat. Birds on formulated diets do not require additional supplements. Birds converting to a pelleted diet, or those that persist on a seed based diet need to be given supplemental vitamins and minerals. Additional calcium, in the form of cuttlebones or crushed oyster shell can be offered to smaller birds or birds that are reproductively active. An iodine block should be offered to budgerigars, to avoid goiter development. Fresh water must be provided at all times and the container cleaned daily. A bowl is preferred, but if choosing a sipper bottle, closely monitor to ensure it is working properly and the bird is using it. Providing more than one bottle, in case of a malfunction, is recommended. The necessity of providing hard, indigestible grit to aid with digestion in birds is no longer recommended for the larger parrot species and for small caged birds, a pinch of digestible oyster shell in the seed dish 1 - 2 times a week is sufficient. Birds such as lories and lorikeets require specialized diets that simulate the nectar diet they eat in the wild. Birds with a predisposition to iron storage disease, such as toucans and mynahs, should be offered formulated diets low in iron and Vitamin C. Certain finch breeds benefit from insects added to the diet. Commercially formulated diets are also available for pigeons and doves, backyard poultry and fancy waterfowl. A wild bird spends most of its day foraging for food. Good nutrition will help keep a bird physically healthy, but allowing the bird to forage for its daily sustenance helps enrich its day-to-day life. Placing food in different areas of the cage and using foraging toys or food puzzles engages the bird and allows it to ‘work’ for its food. Saving desired food items (such as seeds or nuts) for training sessions can help motivate a bird to learn a desired behaviour. For examples of foraging activities, please check the Avian Studios website.